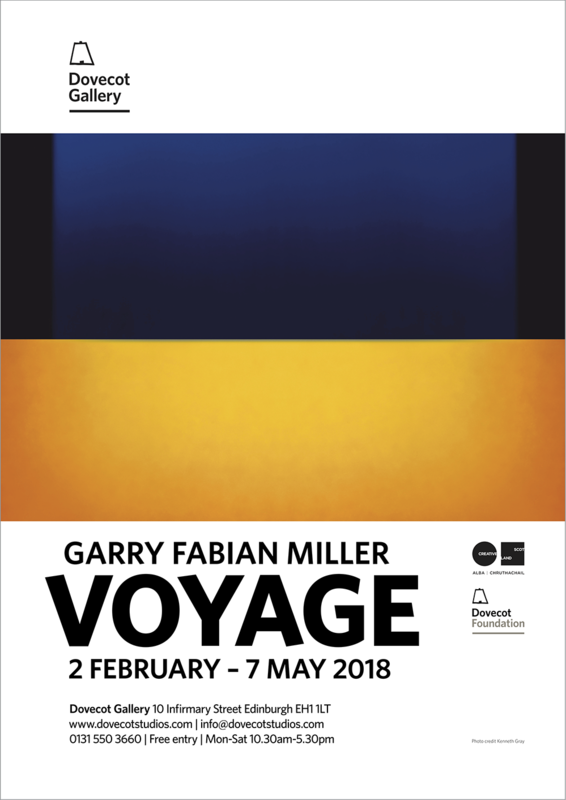 One of a set of six posters that I designed for Garry Fabian Miller VOYAGE, Dovecot Gallery’s latest exhibition, which showcases a new Garry Fabian Miller tapestry created in collaboration with Dovecot Tapestry Studio. The tapestry, Voyage into the deepest, darkest blue is not a direct copy of one of Fabian Miller’s prints – instead the wool blends were developed to make a new image based on the amalgamation of two photographs. The exhibition looks in detail at the processes, from the perception and selection of colour in tapestry to recent changes in digital photographic printing, that have had a major impact on Fabian Miller’s work. The other five posters that I have designed show – in a fascinating series of photographs taken by Kenneth Gray – the tapestry being woven at Dovecot with the team of weavers hard at work. I have also designed an invitation card for the exhibition using the same type treatment with a full bleed image of the tapestry on the loom that has been printed by Allander, Edinburgh on 300gsm Vision Superior. The type treatment has also been used by Dovecot for vinyl graphics in the exhibition. This is the second poster that I have designed for Garry Fabian Miller at Dovecot: in 2015, I designed a poster and invitation card for the exhibition, DWELLING. In the treatment of type, this latest poster carries echoes of the first poster (as suggested in the brief from Dovecot) to create a link between the two exhibitions – though type enthusiasts will spot that the DWELLING poster is set in Calibri while VOYAGE is set in Dovecot's ‘official’ typeface, Whitney. The DWELLING Poster can be seen here. Garry Fabian Miller VOYAGE continues at Dovecot until 7 May 2018.